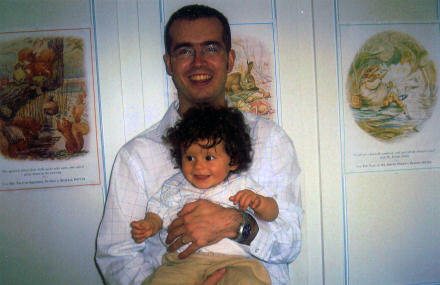 While I’m scanning photographs, here is a recent photograph of my brother Edmund and his son Owen. This was taken by Mum, I think, following Owen’s baptism. Both Eddie and Owen were dressed almost identically; Eddie and Mini-Me, indeed. Since I’ve last seen him Owen is now crawling; Jane returned from Rebecca and Eddie’s last weekend with a video on her mobile phone of Owen crawling quickly across the living room. Don’t they grow up so quickly!